The unique publishing requirements of science and technology companies won’t be understood by the average agency or contract publisher. Europa Science, with almost 15 years’ experience of producing its own science and technology titles, can provide an unrivalled end-to-end service with an understanding of your market that few can match. Writing – if you know what you want to say, but don’t have the time to put pen to paper, we can help define the brief, and generate copy that meets your needs, via our in-house expert editorial team, or our network of trusted specialist writers. Editing – if you have content that needs knocking into shape, we can bring our experience to bear to help structure it in a way that’s best for your target audience. Design – our experienced design and production team have all the tools at your disposal to make your content shine through sparkling layout, supported by access to major image libraries. Print and distribution – we can also arrange to have your publication printed and mailed to anywhere in the world. Digital magazine design and distribution – remove print costs but retain the flexibility of magazine design with a digital publication. The FTTH Council Europe is an industry body which aims to improve the availability of fibre-based access networks to consumers and businesses. 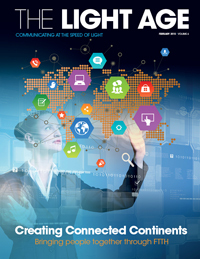 It is part of the FTTH Councils Global Alliance, which produces an annual publication, The Light Age, that showcases the work of the councils. Europa Science produced two editions of the magazine. The project involved a mix of original content generation, editing, design and layout, image sourcing, proofing, and printing. 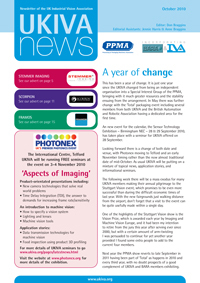 Until becoming part of the PPMA, UKIVA (UK Industrial Vision Association) engaged Europa Science to produce its twice-yearly 8-page newsletter. The organisation had worked with us in the past through our magazine Imaging and Machine Vision Europe, and so was confident of our in-depth knowledge of the industry, as well as our expertise in editorial, design and layout. As part of our service to UKIVA, we also distributed the title, in print and digital format, to the UK and Ireland readership of Imaging and Machine Vision Europe. ‘The UKIVA newsletter has arrived on time, and looks really good. You have a done a great job of putting it all together quickly and efficiently’. To enquire about our contract publishing services, contact Warren Clark on +44 (0)1223 221031.